After an extremely productive couple of weeks, we are finishing up our work at Stoer! We'll take some quick ChemCam and Mastcam observations of the tailings dump pile tosols before packing up and starting our drive up the ridge towards our next drill location. As we leave Stoer, I'd like to take some time to share the story of how and why we came to drill this particular location. 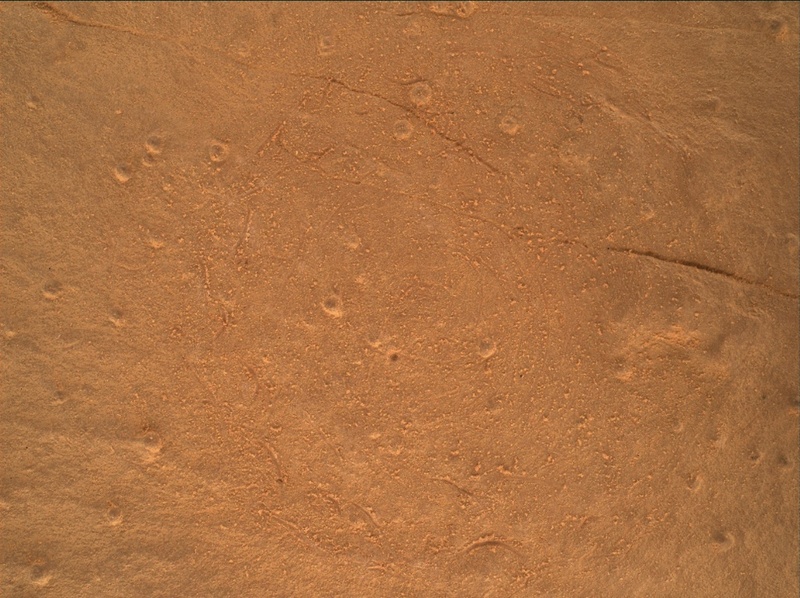 We first attempted to drill Vera Rubin Ridge back on sol 2112 at the "Voyageurs" target. However, the drill made only a few millimeters of progress into that target before stopping because the rate of downward progress was so slow. The drill itself performed exactly as it was designed but the Voyageurs rock was simply too hard! It was pretty interesting from a science perspective to see this result, but it also meant we had to work quickly to figure out a plan B. The science team agreed it was scientifically important enough to get a drill sample from the lower part of Vera Rubin Ridge that we should try again. But how could we improve our chances of finding a rock that would be softer and easier to drill than Voyageurs? It was time to think like geologists. In the absence of direct data on rock mechanical properties, we came up with three criteria that we could use to try to find a softer rock. (1) Did the bristles of the DRT brush leave scratches on the rocks' surfaces? While not necessarily a direct indicator of what the rock strength would be when we drilled into it, we could at least say rocks that got scratched with the DRT had a softer surface than those that didn't. (2) How well exposed are the white calcium sulfate veins? On some rock targets, like Stoer, we clearly see veins. On other targets, like Voyageurs, the veins are recessed into the rock. Recessed veins erode much faster than the surrounding bedrock because the surrounding bedrock is harder. Non-recessed veins tells us the bedrock may be similar in strength to the veins, or, if the veins stick out, the bedrock may be lower in strength. (3) What does the large-scale topography tell us? Broadly, Vera Rubin Ridge is a ridge because it is composed of hard rocks that are more resistant to erosion than their surroundings. We realized we might use this same logic to find softer rocks within the ridge by trying to drill in local topographic lows or at bases of scarps where the bottom of the scarp is eroding more quickly than the hard rocks on top. Fortunately, because we had already explored a lot of Vera Rubin Ridge, we already had lots of data in hand to search for our next drill targets. Several members of the science team put in impressive efforts to quickly go through all of the images we'd taken in the last 200 sols, and we found just a handful of candidates than fit our criteria. The area near "Ailsa Craig" was close to Voyageurs and looked different enough that we thought it was worth a go. We made more progress drilling into this target than Voyageurs, but still not enough. "Stoer" was our final choice, and it was initially chosen because it was near the base of a scarp and had more prominently expressed veins. We all had a really good feeling about this target when we saw the DRT had scratched it, and were thrilled when we saw a successful drill hole. Apparently third time really was the charm for us! Looking back on all the drills over the course of the mission, I think Stoer has got to be one of my favorites. Not only have I been personally wondering about the rocks on Vera Rubin Ridge for six years, but the fact that the science team worked so hard to find this not-so-hard rock makes this particular drill extra sweet.